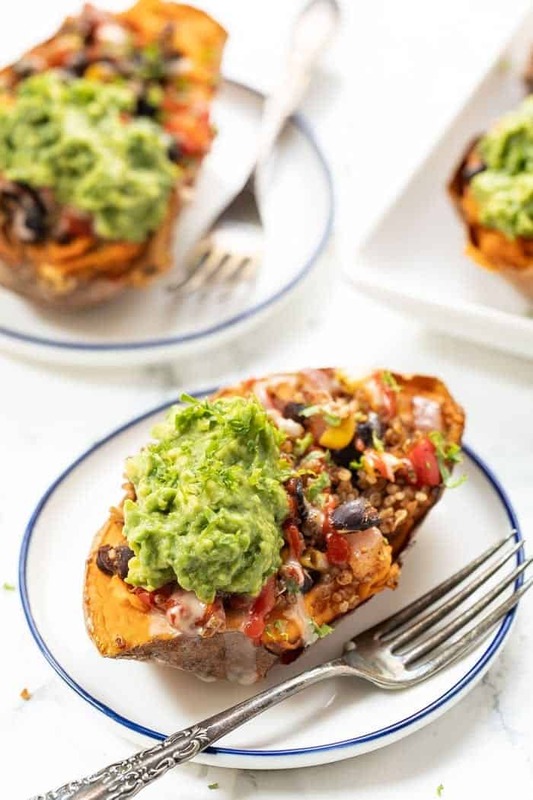 This recipe for Mexican Quinoa Stuffed Sweet Potatoes is an amazing way to pack in a ton of plant-based protein in a tasty, gluten-free and simple meal! I have long been obsessed with sweet potatoes. They're one of those ingredients that I have in my pantry every single week and we never get sick of. Part of what I love about sweet potatoes is their versatility. You can cook them a ton of different ways and they can be used in salads, bowls, as a side and more. But sweet potatoes in our house are usually not the star of the show. They're there as a bonus or a side. Until now. 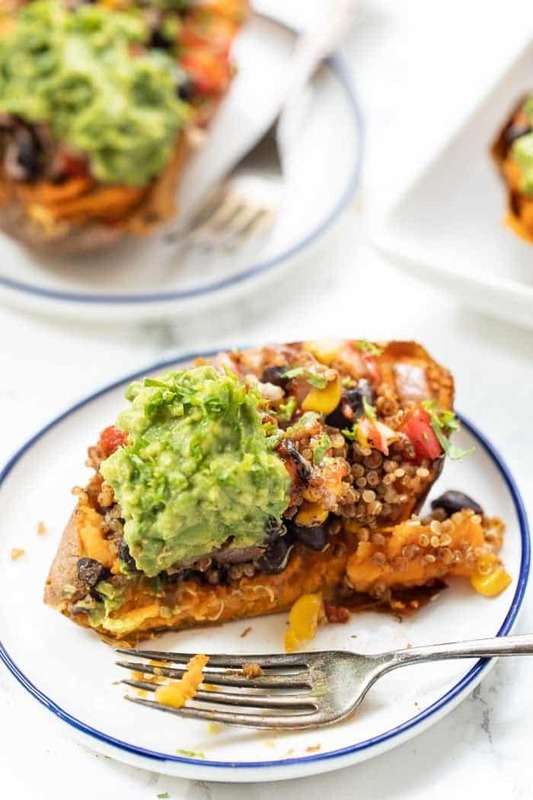 Because when I whipped up these Mexican Quinoa Stuffed Sweet Potatoes…everything changed. 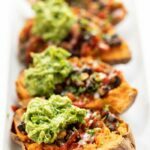 Why are Sweet Potatoes Healthy? It seems that everyone in the health world raves about the nutritional benefits of sweet potatoes. But are they actually that healthy? The short answer is YES! 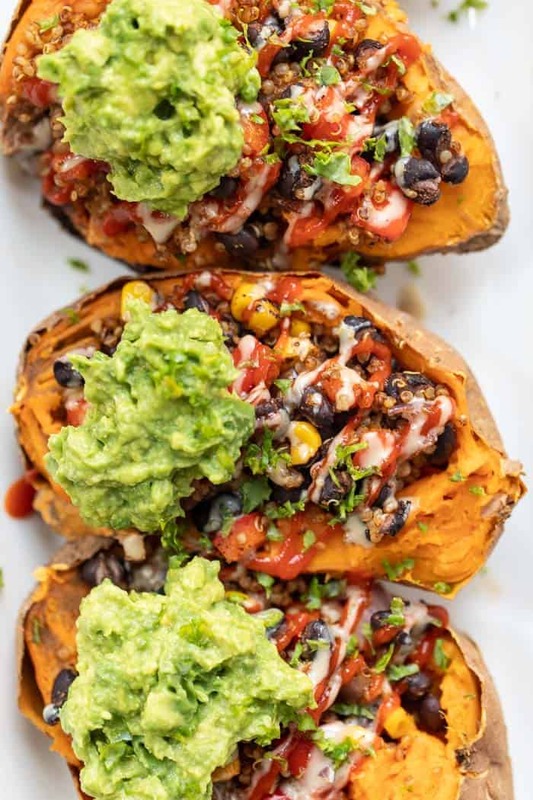 Sweet potatoes are packed with a ton of vitamins and minerals and are what I would consider an “everyday superfood” meaning they're cheap, they're nutrient-dense and they're just an all-around superstar. Some people might be afraid to eat a lot of sweet potatoes because they're high in carbohydrates as well, but I totally disagree. Yes, they are a carbohydrate, but we need carbohydrates to sustain us. We need them for energy and live our healthiest life. Which is why I was so excited to discover how delicious this recipe is! 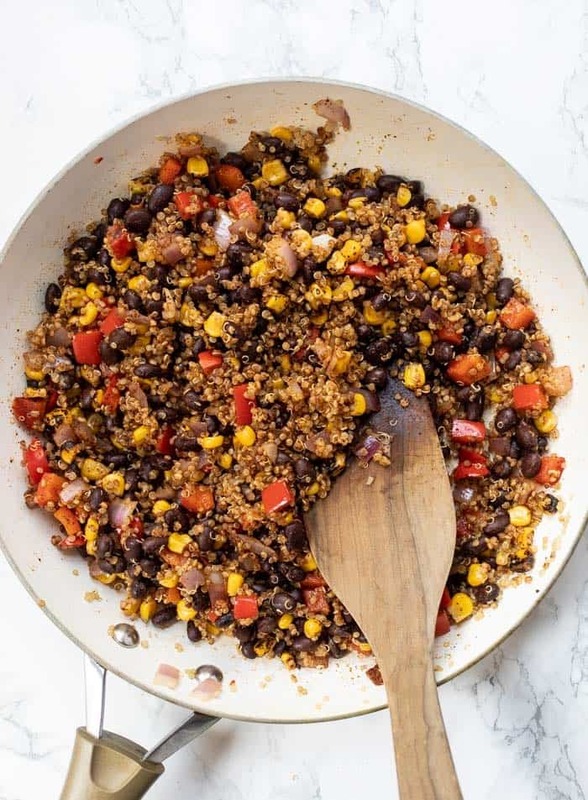 It makes sweet potatoes the star of your meal by using them as your base and stuffing them with a super quick Mexican quinoa mixture. It's quick, it's easy and it's totally healthy! 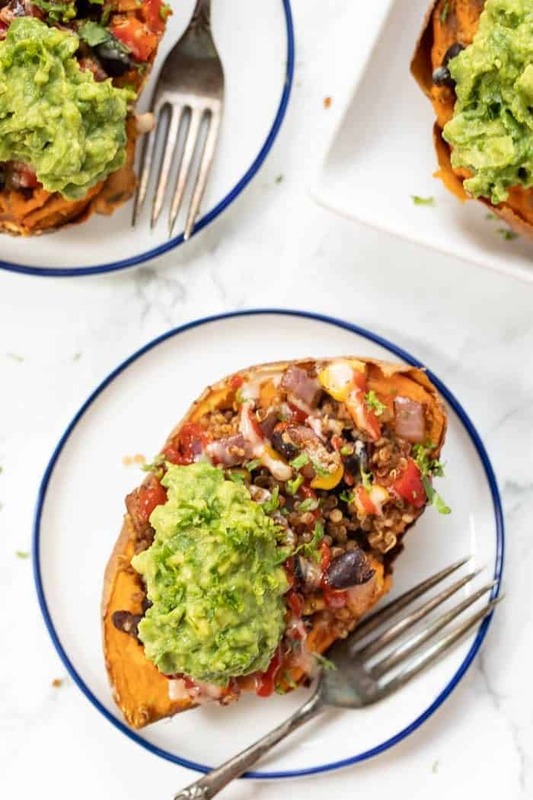 I've made quinoa stuffed sweet potatoes once before, but when I was dreaming up this recipe, my mind immediately went down the Mexican-inspired route. 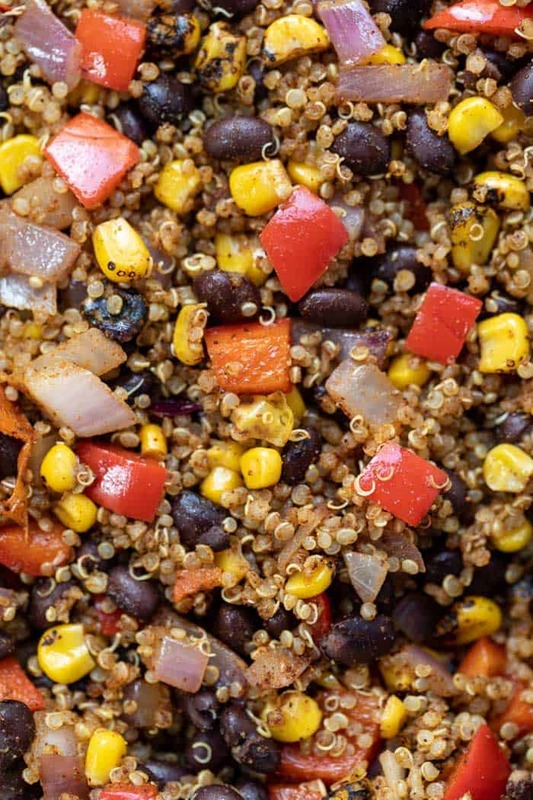 So for our filling, we're making a quick saute of onions, peppers, frozen corn, black beans and quinoa. You can whip it together in about 10 minutes while the sweet potatoes are roasting and it has the most amazing flavor! We're spicing it up with a ton of chili powder, some cumin, a touch of smoked paprika, and if you like heat like I do, some cayenne pepper. It pairs perfectly with the potatoes! When I was serving these babies up I was thinking of them almost as an open face burrito! So we did a generous dollop of mashed avocado, a drizzle of tahini (my sour cream replacement) and hot sauce, and finishing things off with a sprinkle of cilantro. Preheat the oven to 400ºF. Place sweet potatoes on a baking sheet and prick with a fork. Place in the oven and bake for 40 minutes. When sweet potatoes are fork tender, remove from oven and let rest for 5 minutes. Slice in half and place each half on a plate. Top with quinoa mixture, avocado and a drizzle of both tahini and hot sauce. Finish with a sprinkle of cilantro and enjoy!